Scotland seems an unlikely place for a chocolate company, but then so does Minnesota. Perhaps they cherish the rich, warm flavor of good chocolate for the same reasons we do here in the land of perpetual ice and snow. 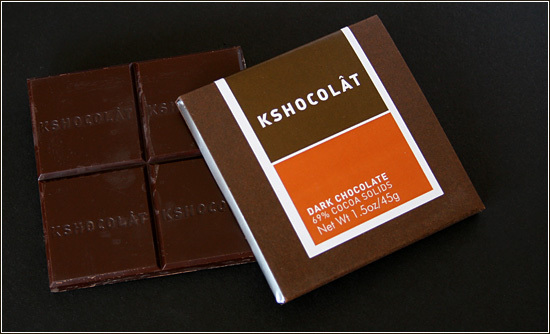 The flavor of the 69% dark chocolate bar is warm and slightly honey sweet. There seems to be a very light mint finish and the overall effect is quite subtle. I would suggest that this would be a good chocolate to nibble on during a heavy make-out session but I won’t because I know this blog is read by millions of school children around the world who would interpret that as “gross” which of course is the reverse of what I mean. The 1.5 oz bar featured here is not actually bar shaped but a square divided into four smaller squares. It seems slightly thicker and makes a great snap when you bite into it. Packaging and website design were created by Marque and both are really fantastic. The entire line of chocolates is given some consistency through the use of clean contemporary design with rich, earthy tones and strong, sans serif type. The tins are super cool and you would want to find another use for them once emptied of their chocolate goodness. Based in Scotland (with additional offices in London and New York) Third Eye Design has a nice collection of clean and elegant design work in their portfolio and the packaging they’ve done for Kshocolat is no exception. They also created the website which is something of a stand out in this category. The black background and reflections aren’t exactly revolutionary but do a great job of enhancing all the colors for a rich effect. Their is some bold type similar to the packaging, but the site is pretty light on information. That’s strange since most chocolatiers are so eager to tell you the source(s) of their cacoa. It would be nice if they added that somewhere. I also think the Kshocolat logo would look great in white on a dark chocolate brown t-shirt but perhaps I’m getting carried away. Available through The Meadow. You can also order it from them through Amazon.com. My order shipped quickly and even included a sample of another chocolate and a coupon for my next order. Cool!